I've shared My Favorites HERE, but now I want to tell you about those markets I'm dying to go to. Yes, ok, that's a bit dramatic. But you already know I get really excited over this stuff. We are moving sometime within the next month (we still don't have a moving company or flights booked - talk about last minute stress!) so I don't know how many of these we will get to, but I am really hoping to make these last few weeks in Europe something special! Basel is rumored to be one of the prettiest Christmas Markets in the region and is the largest in Switzerland. I haven't been to Switzerland, and I think this is a great time to remedy that! More information can be found here and here. An easy drive from where we live, we love to visit Stuttgart. Our favorite Mexican restaurant is Cocina Mexicana in Vaihingen and we eat there every time we're in the area. I've heard from another woman living here that Stuttgart's Christmas Market is delightful, and when paired with the medieval market in Esslingen, the whole experience is magnificent! Find out more here and here. I should have listed this one first, because it is, by far, my biggest priority this year. Prague might just be my very favorite city on the continent and I know it's my husband's favorite. We've never been at Christmas, but I'm willing to move heaven and earth to make it happen this year. Check out more info here and here. A cute little town on the Rhein River near Mainz, it's an easy drive from where we live and will make a nice little day trip. I've heard many excellent reviews of this market so I'm looking forward to checking it out. Find out more here. Yes, I know I've been. And, frankly, I don't think I'll be able to put this one off until all of their markets are open if we do get to go this year, but still - a day in Paris is always a good day for me. If you will be in the area during the holidays, find more information here and here. This is one trip I recommend planning well if you're very interested in seeing all Paris has to offer. Krakow is such a beautiful city! I can't even begin to imagine how much more wonderful it would be at Christmas. Hopefully one day I will find out, but it's not going to happen for me this year. It's just too far away with all that is going on. Maybe you can go and let me know how it is? And if you're looking to combine Christmas markets with a little skiing, there's a beautiful resort south of Krakow called Zakopane. If you're looking for more info you can find it here or here. Side note: After writing this, I heard from several people that Wroclaw, Poland has a gorgous Christmas Market that blows everything else away. Maybe next time we plan a trip to Poland, it should be during Christmas and we'll see both. More information here. I'm not sure what to say about this one. I think since Hamburg is a port city, seeing some of the floating markets would be a different experience and may be worth doing. But, also, they have an X-rated, adults only type market at Santa Pauli. I'm not interested in buying anything, I'm just very curious how that ties in with Christmas. It's one I might have to see to believe. If you'd like more info, it can be found here. I'm quite fond of Amsterdam. It's not big or showy and its more, ahem, popular delights aren't for me (there IS more to do in Amsterdam besides getting high), but it's a comfortable little city to spend a few days in. The weather is dreary more often than not (at least when I've been there) but I've enjoyed myself immensely every time I've gone. I always feel relaxed and comfortable there. Maybe they pump some of those aforementioned delights into the general air? I'm not sure, but every time I go the city grows on me a little more. 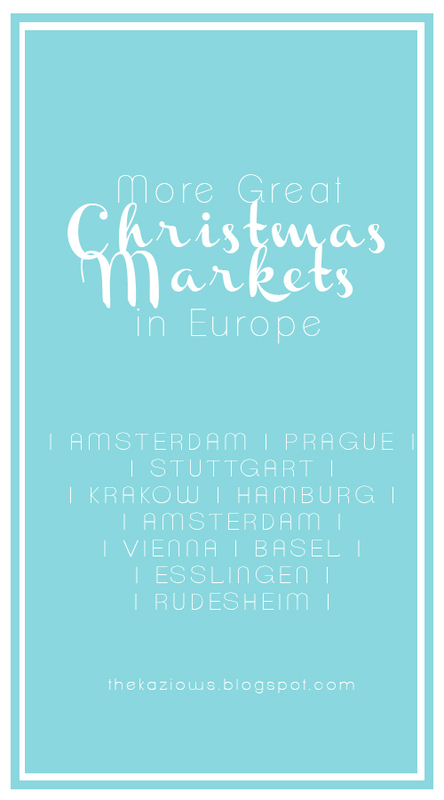 Christmas in Amsterdam just sounds wonderful. If you're heading that way, you can find more info here. I read somewhere in a book recently that people in Vienna still dress in traditional clothes (dirndls and lederhosen, etc.) rather frequently. Of course, the clothes have been modernized, but that overall it's a very formal city. I'd be interested to see that. I have no idea if it's true, as I've never been to Vienna. Imagine for a moment, though, being all dressed up and going to a Christmas Symphony in one of the great halls of Europe, after having spent the day wandering some of the most enchanting markets around. Heaven, no? Find more info here. This was a suggestion from another family who lives near here, and after checking into it... oh, my. It sounds WONDERFUL. Every Friday, Saturday, Sunday they have live angels perform and the whole town is turned into a living advent calendar. Whoa. I really think I need to go see this. If you would like more info, you can find it here or here. That's it for me. If I could take the next month, with an unlimited budget and no other responsibilities (why, oh, why did I insist on growing up?!? ), those are the markets I would visit. So tell me your dream sheet. Where do you want to go? What are your favorite places you've been? Do you love Christmastime best? Or does another season steal your heart? And remember - sharing is caring! So share away!